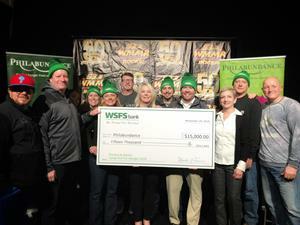 WILMINGTON, Del., Nov. 29, 2018 (GLOBE NEWSWIRE) -- Philabundance, the largest hunger relief organization in the Delaware Valley, is the recipient of a $15,000 donation from WSFS Bank. WSFS Associates and volunteers presented the donation to Philabundance at Preston & Steve’s Camp Out for Hunger 2018 that is taking place at Xfinity Live in South Philadelphia. WSFS Bank is a sponsor of the 2018 Camp Out and a loyal, long-time community advocate in the fight against hunger. WSFS volunteers have also collected food donations at the week-long Camp Out, which is the largest single-location food drive in the country. WSFS Bank's Shari Kruzinski, Senior Vice President and Director of Retail Business Initiatives (center); Patrick J. Ward, Executive Vice President and Pennsylvania Market President (left); and Justin Dunn, Senior Vice President and Chief Marketing Officer (right); surprise Philabundance with a $15,000 donation to fight hunger at Preston & Steve’s Camp Out for Hunger 2018. 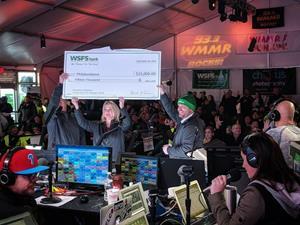 WSFS Bank Associates present the $15,000 donation in the fight to end hunger to Philabundance at Preston & Steve’s Camp Out For Hunger 2018. For 15 years, WSFS Associates have collected and donated nonperishable foods in annual fall drives at WSFS Bank locations across Delaware and Pennsylvania. Earlier in 2018, WSFS Bank celebrated a milestone of one million meals served from those collections to feed hungry children, adults and families in the communities the Bank serves. WSFS Bank Customers and residents of the Delaware Valley are encouraged to take their nonperishable food donations to the Camp Out, which ends Friday, November 30. WSFS Bank’s own fall food drive with Cityteam in Pennsylvania and the Sunday Breakfast Mission in Delaware will run through the end of the year and donations can be made at any WSFS Bank location. To find the nearest WSFS Bank, visit wsfsbank.com.